I woke up to the sound of my doorbell. Either it was my landlord, a surprise visitor, or the person who comes to check the gas at really random times. I wasn’t about to get out of bed, so I just laid there hoping they would go away. The doorbell continued to ring. And ring. And ring. There was pounding. Quiet pounding at first, followed by loud bangs on the door. Who could it be? What do they want? My apartment was a mess, I felt sick, and to top it all off I was naked. The last thing I wanted was a guest. After a few more desperate tries, the morning raid was over. I heard footsteps walk down the stairs, and the sound of the automatic door to my building opening. It was safe to go back to sleep. Or, so I thought. Not long after I dozed off, the doorbell started to ring again. This time the attempts were more aggressive. Whoever it was kept a finger on the button. A constant, relentless ring filled my apartment. There was more pounding too. And I heard the doorknob shake. Somebody really wanted to get to me. I pulled myself out of bed, quickly dressed and opened the door. It was my landlord with his big grin. He has the best little-Korean-man smile. We bowed a bunch. It was obvious I had been sleeping. He made an eating motion (which means he had food to give me), before going back to his apartment. We can only communicate through acting. He came back with a big bowl of tteokguk (rice cake soup) and mandoo (dumplings), with a pile of kimchi on the side. It was served on a glittery tray. Just for me! 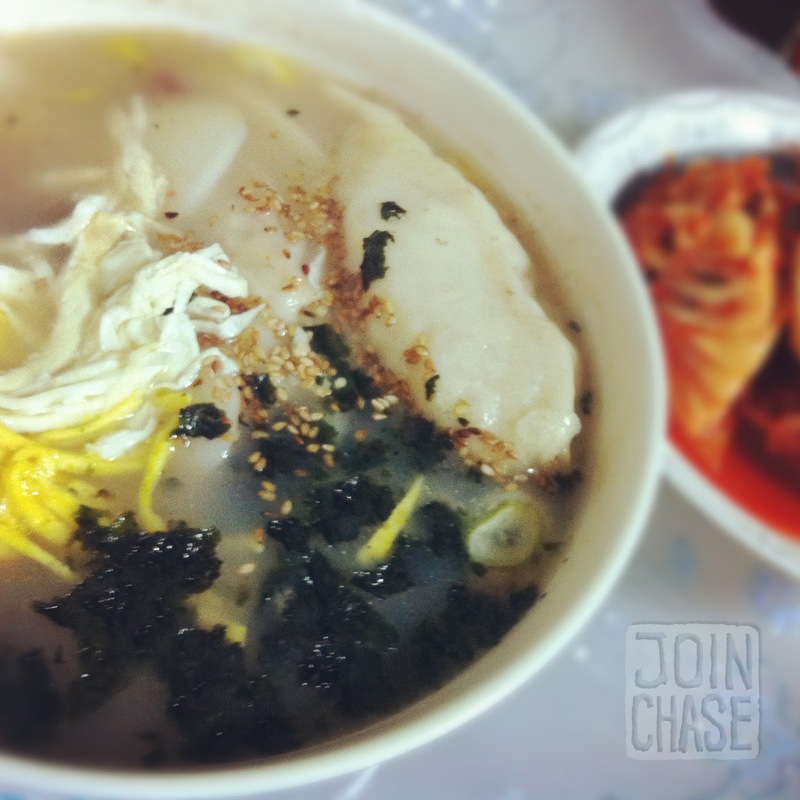 This particular kind of soup is commonly enjoyed during Lunar New Year in Korea. Today is the last national day off for the holiday. Even though my landlord practically busted down my door to get me out of bed, I’m so thankful for his kindness. This will be the perfect opportunity for me to write out a translated message of gratitude to him and his family, via the help of a Korean friend. Thanks for your comment, Gun-Woo! I hope you're doing well. Best of luck in everything.